Spiritual mentor; leadership coach & trainer; couple's guide; artist-activist, WOMEN's power all in service of a just and sustainable world. September 2, 2015. Within a few hours of arriving here we have rented a scooter and are on our way to meet Martina at the Port Police Station in the town of Lakki. Martina is pointed out to us, a cell phone near her ear. 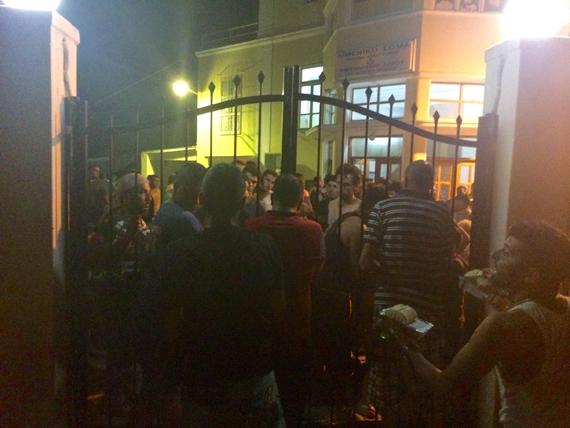 There are hundreds of refugees basically locked inside the Port Police compound and others huddled on the sidewalks. Within the next few hours we are handing out water, crackers, diapers, baby formula.... Trying to answer questions we don't know how to answer, including what is happening, how long they will be there, why there is no food or water or toilets, why they can't leave to go find food or a shower or a bathroom. We are looking for shoes and clothes in a small dark moldy room where our supplies, such as they are, have been stored. There is one overflowing porto-potty. No privacy, no beds, very little shade, only cement or dirt to sleep on. We are handed an empty insulin injector, shown infected cuts, goopy eyes on children. It is immediately clear that there is way too little in the way of basic needs, and that the delivery of what little is there is completely totally chaotic, with a few volunteers trying to fill the gaping holes as best they can. 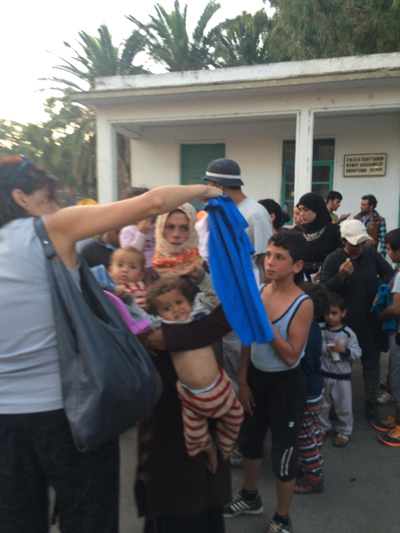 Dora handing out clothing to those who have just arrived- many have fallen in the water, some men swam alongside their rafts over loaded with more than 50 people, trying to hold the women and children safe inside. Then Martina and her friend Dora, a psychologist, whisk us to the port where we watch Martina try to insure that the people who have made it this far have legitimate tickets for the boat to Athens that is leaving soon. She is a whirlwind of energy - a constantly moving target. So we watch and wait, trying to get a handle on how we might be of any help at all. Waiting to get on the 11pm boat to Athens, most are sitting at café tables with some food and beverages. Some are sitting on the curb with their children. We offer bottles of water and boxes of biscuits. Back at the Port Police Station there are clusters of people outside the gates. We don't yet understand why some are inside and others are milling around or trying to sleep on the sidewalks. We find some who need medical assistance. Alla, a lovely Syrian woman of about 30, has an enlarged spleen. "spleen spleen" and "big big" says her cousin. Alla shows me her medical papers. She has no more medicine. She is in pain. She is frightened. I find myself holding her as she cries leaning into my shoulder and saying "thank you thank you." Dora shoos us off towards the medical clinic. Alla is leaning on my arm. Tevon has adopted a family -a child with an infected eye, another with a rattling cough. A grandmother, an aunt, an uncle, a small baby, a toddler all come along. I manage to get permission for Alla to lie down on a metal table. My hands touch her belly, stroke her head. My breath instructs her to deepen her breathing. We wait, her hand over mine on her belly, her eyes leaking tears. Eventually a doctor sees her and the others and Tevon runs off to the pharmacy with prescriptions. Almost two hours later, we are walking back to the gates. There are many kisses on both cheeks as we leave them to go back inside the locked and guarded compound. Medicine is needed but it is only for the children or the most serious cases. It is available only in those rare and unpredictable moments when the Doctor is at the clinic. Then we are back at the Port Police compound and the energy behind the metal bards, the chained gate is restless, scared, upset. Literally there is only dirt to lie on and no toilet for over 200 people. Then there is a flurry of water delivery and pouring juice for the children, initiated from some unknown person inside the Port Police building. Inside and outside the port police building. I begin to understand we are simultaneously part of the kindness corps and of the police, trying somehow to do crowd control. Armed with our compassion and desire to do good, yet knowing the harsh limitations of the system, we become the naysayers, the ones saying "so sorry so sorry." "I am sorry, I don't know when they will let you out." "No they will not let you go buy food for your family." "I am sorry we have no more shoes, no more food." "Yes I know the one toilet has been overflowing for days." "We are only volunteers." "We are not in charge." "We know it is terrible and it will be for 3-4 days." "We are so sorry, please try to be patient." I have said more "sorrys" in a few minutes than I have said for years. Without a second thought I have given up my vow to not use plastic bottles. Even this small act of symbolic conservation now seems an expression of my privileged lifestyle. I gesture for them to keep their cups -- I don't even know if there will be more tomorrow. These are our first five hours on the ground.